Dr. Li Li is Chairman of the National Rongxiang Xu Foundation. She was born in an intellectual family of Jinan, Shandong, China, Her childhood was happy with singing and dancing, making friends, helping others. 1970s, Dr. Li was admitted to Shandong province Sports team and became a national athlete. After graduating in 1982, Dr. Li worked as a Pediatrician in Jinan Fourth People’s Hospital . In 1985, Dr. Li was married to Dr. Rongxiang Xu who graduated from the same Medical School of Qingdao. With the pace of China’s reform and opening up, the mid-1980s, Dr. Li Li was following her husband, Dr. Xu, to Beijing started their new career after resigned from the hospital’s job. From research on burn regenerative therapy, to declare drug patents, trademarks, to declare China FDA approved the first new drug certificate issued, Dr. Li was unwavering support throughout and assisted Dr. Xu. Dr. Li couple started with self-financing, and created the Beijing Guangming Chinese Medicine Institute of Burns. As an one of founders of MEBO career, Dr. Li assisted her husband, Dr. Xu, to set up a new drug research and development production and marketing, and created the First Chinese Journal of Burns sponsored by a private enterprise. By the Chinese Ministry of Health recognition, and the China Medical Doctors Association co-operation, the Chinese Journal of Burns promotes to a national magazine of burns regenerative therapy. Now, the Chinese Journal of Burns has been collected by Harvard University, Stanford University and the Johns Hopkins University’s libraries. To support Dr. Xu, Dr. Li has assumed responsibility for all education and training of their child. Dr. Li makes her best efforts for the future and the development of MEBO development. Dr. Li also actively are developing her own business. In 1996, Dr, Li has been successfully involved in the field of Medication, Real Estate, Tourism and Culture exchange, etc. 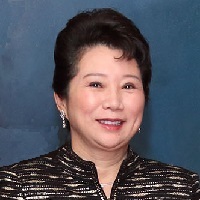 Dr. Li has been served as the president of MEBO America, Vice president of MEBO International Group, the president of MEBO real estate company and the president of MEBO travel company.